Before heading out to the grill, I like to assemble all my ingredients and tools to make sure I’ll have everything right on hand. A half sheet pan is perfect for organizing and transporting everything quickly and safely. As I mentioned earlier, thick slices of bread are best. 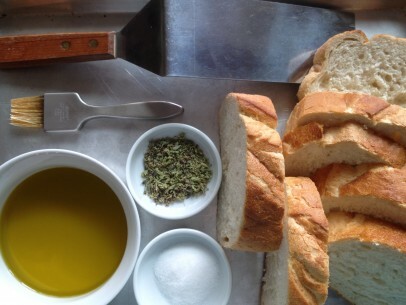 And the bread should be good quality – that is, not too crumbly or too mushy. Bromated bread (yuck!!) will turn to dust so don’t use cheap bread! White or wheat, its your choice. I just don’t recommend hard grains like barley or rye though. They get a little too hard too fast in my experience. For a bakery loaf of white Italian or French bread, I often wait a day or so after buying a fresh loaf to let it get, not stale, but a little less fresh. Seems to work better for this purpose. 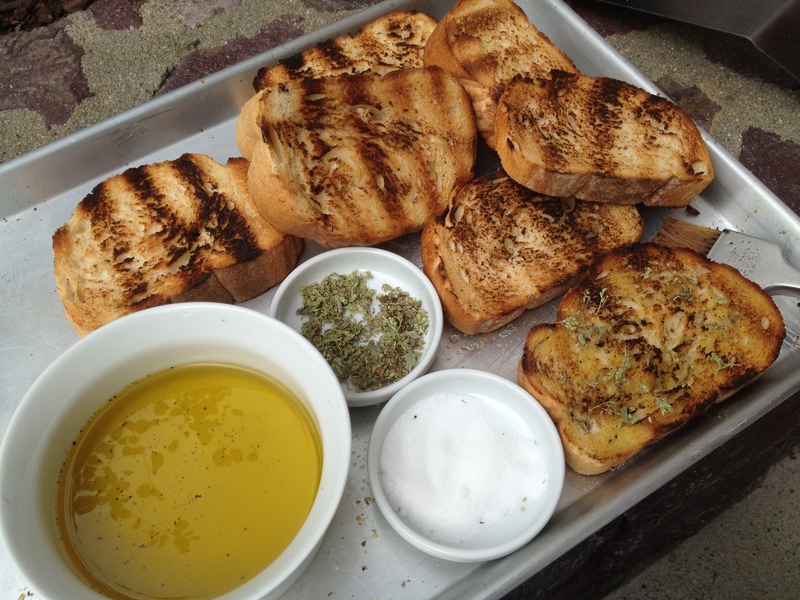 And it may seem counterintuitive but you grill the bread DRY and once they’re toasted, brush liberally with olive oil. It makes a big difference to add the oil while bread is still warm. This way you get a well toasted crunchiness outside AND all the delicious flavor of your olive oil inside and not a soggy, smoky slice. Remember to move the slices around a bit as each side is toasting. You want nice grill marks but you also want the entire slice to be just golden brown. 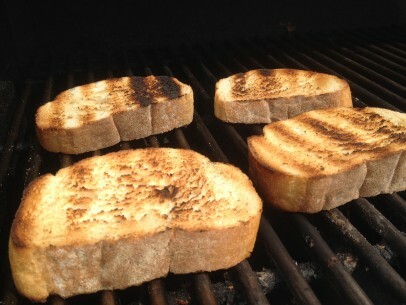 If you don’t move your slices, your grilled bread will end up with unsightly tan lines or white stripes where they didn’t meet any heat. If I have an extra minute or two, I usually do a test slice before adding the whole batch as each time you grill the heat/flames are different. 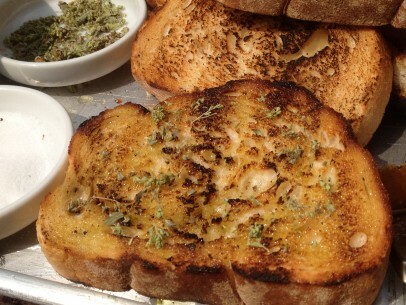 Here are a few other great ways we enjoy toasted bread λαδοβρεχτό! All my family love this, very simple and great way to use up bread that’s not so fresh anymore. Tina, many village bread bakeries (fournos) will still use sourdough starter instead of dry yeast as the leavening agent which we in the US are more used to. If you can find, local to you of course, a sourdough brick oven baked bread that will bring you pretty close!